So if you read the past ten posts ten times, that would equal 100. Can I admit that God gave us exactly what we could handle, and it didn't include me blogging for 100 days in a row? Women who can raise a brood, write, cook, and teach are of a superhuman race. I'm deciding, for my own sanity that I have stepped up my blogging and that's the best I can do right now. There is a season for everything and this is my season of wading through teen, tween, and toddler at once. For example, every other Friday I teach Chemistry lab at our homeschool co-op. It means leaving the house. Yeah, you thought there would be more to that sentence, but there wasn't. Leaving the house is a big deal in itself, especially in the morning, with supplies for a lab and necessities for baby survival. I arrived an hour before class to get things set up. Everett has model United Nations for an hour before lab, and the other bigs watch the babies while I run around. I stopped on the way for donuts and bagels, a Friday morning tradition. I raced to drop Everett off, and unloaded the van. Baby strapped to my chest, toddler in the stroller, glassware and breakfast were stowed underneath--I was on top of things. In the scramble to get out of the house, my meticulously packed diaper bag, which is actually more like a diaper suitcase, was left behind. My 'on top of things super mom' bubble deflated. It was replaced with the 'I can't handle things and even left the diaper bag at home' storm cloud. On a more positive note, I didn't forget a baby. Christmas list time is upon us. I hate them. I hate the list making and the gimmies that arrive with the Target catalog. I hate that I don't have the willpower to break the habits of list making has become Christmas in our house. You know, an idyllic child who puts others far above self and gives sacrificially without being asked. I can't expect our children to do what I've never been willing to do myself. Can I? Though I don't sit down with the 300 page Toys-R-Us extravaganza and a black sharpie, I do send out a list to my family. I collect the lists from my children and work to satisfy each of their desires. Since, somehow, they will grow up as loving and satisfied adults if we give them everything they ask of us. Right? I'm still working through this generosity vs greed thing. I wouldn't call any of our children greedy. I daresay, if we had a family meeting this week and argued for spending all of our gift money on Jirigna and Dirbe in Ethiopia, they would agree that we don't need a thing and we should give to our friends in need. But, I would have to decide to hold that family meeting. Every year I feel the same way. I'm always excited to do something. We send donations to build a well one year. We buy some supplies for a school the next. None of those gifts required a sacrifice from our family. That's where I get stuck. I'm unwilling to ask our children to give up the 'magic' of a Christmas morning spent opening gifts. I would love to hear from any of you who have figured this out. I have only two years left before we send Everett out into the world as an 'adult' and I still haven't figured out how to be a good parent during this Christmas season. Can I call this Day 9? I am a failure as a blogger. Two months ago I felt guilty about not finding time to write. Slowly, with the madness of life, that guilt slipped away until I didn't give writing a second thought. Then, I talked to my Grandma. I love my Grandparents. My only complaint is that they don't live next door. We don't see each other often and we rarely talk. I take full responsibility for everything. She mentioned my blog. She mentioned me writing for 100 days. Her excitement...and my failure. Not really, she didn't mention anything about me failing. She just mentioned that she wanted to hear from me. So, I dusted off the laptop and decided to write. This update is for you, Grandma. I suppose I should begin with where I left off. We still have seven kids. Life is still quite chaotic. I'm exhausted. Seth is exhausted. We are functioning slightly above survival mode. The biggest update would be that the babies' week long stay has turned into nearly three months with us. Our new norm is hard, I can't lie. It would be a disservice to moms out there who are struggling with littles and bigs and schooling and life, for them to hear me say, "This is a piece of cake." This isn't a piece of cake. I let things go that I would have been on top of three months ago. My sliding glass door has dried dog snot on it. If you know how I feel about prints on windows, that's a biggie. I know it really doesn't matter in the long run, so I let it go. Or I remind Josiah to scrub the window, "...and I'm not just talking about at your eye level, I'm talking about that nasty jelly hand print encrusted with dog snot that dried there last week!" So, I'm calming down about how the house looks. Not to say we live in a pig sty, everyone does their chores, but I can't be everywhere, so I have to trust that trash is emptied and litter boxes are scooped. That's one thing that is hard. The other real hard thing is not knowing what is going to happen. That seems like a stupid statement, since life is full of uncertainties. This is a different uncertainty. Today, seven children, tomorrow...five? What's going on with the babies' mom today? Is she making choices that are bringing her closer to reunification? Is she straying? Will they be here for Christmas? Will they be okay next week at their aunt's? It's hard, because they aren't our children. And, we don't want them to be. As much as we love adoption and what it has done in our lives, it comes from a terrible heartbreak. This is the first time that we have stood on the other side of the adoption story. For each one of our children, we have come AFTER their loss. We loved them and adopted them and they were ours. We love these babies, but they are not ours. You will never pray more often for a person as when you are raising that person's children. That is the underlying reality of our days--we are raising someone's children. I don't have time to think about it during the busy days. When I'm snuggling with a chubby, tired baby in his last moments of being awake, I think of his mom. I pray for her, because she's missing these moments. His first birthday. Cutting four teeth. Eating solid food and climbing up stairs. He will walk soon and she will miss his first steps. That's heartbreaking. Her little girl calls me, "Mama" and runs to me for comfort. These are healthy behaviors and it's good that she has them, since she needs a 'mom' now. But it's sad that a family she didn't know three months ago has become her familiar comfort. Her mom missed her second birthday, saying goodbye to her binky, and watching her language explode. That's hard. Then there's the diarrhea for eight days and waking up at night. Seth wearing a mouth guard because he is grinding his teeth. Josiah enjoying the shrieks of anyone younger than him, so his favorite past time has become taunting babies. That about sums our house up. Screaming, pooping, and mouth guards. And occasionally, screaming while wearing a mouth guard because the dog just ate a poopy diaper. No joke. There is a fine line between giving too much of yourself and refusing to help others for selfish reasons. I tend to burn out because I give until I have nothing left. I'm not bragging, I'm admitting that I have issues. I read an article about 'me time' when my five were younger. It was interesting, but probably propagated mom guilt up the wazoo. The writer asserted that you can never have too much 'me time', thus you expect two hours alone during naps and you are irritated when life happens and interrupts that time alone. That well deserved time alone, which she said wasn't a right, was a monster which crept into our lives until we wanted more and more of it. I bought into that short article and bear many scars as a result. It took a long time for me to realize that it's okay to do something for myself. I still feel guilty, but I know that without taking care of myself I can't take care of everyone else. It's a "put on your oxygen mask before helping those in need" lifestyle. The past few days have been busy. That doesn't do the chaos justice. Lovely chaos, as I am watching the Bigs help with Littles. I ask each of the kids once a day how they feel about the new additions. I'm hoping to head off any feelings of irritation or anger by lessening a burden if they mention that. But, no one is taking a poll from me to see what I might be feeling. Did I mention my husband left Monday morning and won't get home until tonight? If he gets home tonight, since he just texted me to tell me that all planes are grounded. It's Everett's birthday. Fifteen years today. Blows my mind. He told his friend he couldn't do an amusement park this weekend because he couldn't leave me with all of these babies. Sweet guy...maybe. I question his motives. Where was that attitude last night? He had a cross country pasta dinner at 6, the girls had soccer practice at 7, and the babies were wailing to eat. Actually, everyone was wailing to eat. So I scurried, and realized that I was the only one scurrying. Between the high chair and stove and back again and in the background...is that Wild Kratts I hear? No time for me to call for help, I continued scurrying and Everett moaned about being late to the pasta dinner. Then he disappears, while I'm throwing meatballs and bread on plates and scooping the messy baby up to accompany us around the corner for Everett's dinner. He is no where to be found and finally after yelling several times I catch a glimpse of him sitting in the van. He's calmly waiting for me to chauffeur him to his party. Deep breath. Another one, because, really, I'm sweaty and hungry and toting a baby that he's going to feed as we drive and frustrated because I was looking everywhere for him. Upon my return, the whole house greets me in the yard. The Escape Artist is sans clothing and covered in marinara. She's full and smiley so that makes me smiley. Then the big four open their mouths and yell four different requests. "Ella's new cleats are both left feet! You need to take her back to the store!" "Can you take me to Speedway to buy a soda? You promised!" "She's covered in pasta and touching everything! Make her stop!" "Mom! I can't find my..."
I might have cried, if I had the energy. Instead, I just covered my face and quietly whispered, "I am so hungry. I am so tired. I need your help." Quietly whispering is scary to kids. I heard that at a women's breakfast. Experience has taught me that it's true. Suddenly, baby was in another's arms. I had a plate of pasta sitting in front of me and the kitchen was a flurry of cleaning. Then, the two girls rode off to practice on their bikes, Everett texted me that he had a ride home, and the house was still. We did baths, books, and bottles. And realized after severe withdrawls that pacifiers are like a drug to some children and losing 'their' pacifier is akin to stabbing them repeatedly in the ear. Or so she made us believe. We did find a second best lost in the lining of the diaper bag, but only after enduring screaming and writhing for 30 minutes. After that, I felt that I deserved a run. I was taking ME TIME. Even when two kids begged to join me, I held strong. And you know what? They weren't heartbroken. They didn't even really care. They played cards and were happy. By the time I finally left it was dark. I hate running in the dark, but I was desperate. It was dark, quiet, and cooler than it had been all day. The run felt soothing. Did I mention it was really dark? Dark enough for me to break a leg by tripping on the sidewalk. I had to cramp my ninja-running by using my phone flashlight to shine on my path. Still, it was a great run, I felt great about finally taking 20 minutes to myself. I felt great because it was so quiet and cool. I was a ninja gliding through the night. Then a bug shot to the back of my throat and I dry heaved. In the dark, quiet, stillness I stood dry heaving in my neighbors grass. A Perfect finale to my day. My parents were alone with Sally in the car on the interstate. As they zipped along, my Dad quipped that he was glad they weren't going the other direction and pointed at the congestion across the median. Sally asked him, "Why is it so busy?" "Because it's rush hour," he said. "Well, what time is it on that side of the road?" she innocently asked. My husband and eldest have now shared their unbelief with me. They don't think I can write anything for 100 days. I had to pause and think, because usually my husband is the grounded one. They may both be right, what am I thinking? Reality sets in though--after so many years Seth should know me well enough to recognize scoffing would make me work harder. Before our wedding, Seth and I wrote letters to our parents and to read during the ceremony. His was long, eloquent, and written on beautiful paper. It now hangs in a frame in his parent's house. I couldn't set my pen to paper. I kept waiting for words to come, but it seemed like one of the most dreadful writing assignments. That letter and the 'let's write our own vows' idea, which was also terribly strenous. We not only wrote them, but memorized them. I have a picture of myself and my friend sitting in the dressing room at the church chanting my vows. That day was high pressure! I did memorize my vows, and I did have something to say to my parents during the ceremony. It isn't framed hanging on a wall, since I never actually got it on paper. It went something like this: Dad, thank you for challenging me and keeping me grounded. Thank you for telling me that my schemes were harebrained and wouldn't work. Mom, thank you for tiptoeing behind Dad and whispering that I could do whatever I set my mind to. It was a touching moment with tears all around. Shortly after that while lighting the unity candle, it lit then tipped over and started rolling. That may be all that anyone remembers from our wedding ceremony. 100 days of writing seems harebrained, but I'm planning on proving Seth and Everett wrong. I drank a soda last night at dinner. It was a long day and ended with a long homeschool co-op meeting. Many well meaning parents making many seemingly important announcements, but too often taking too long. I had to sit on my hands to avoid clapping prematurely just to get a few of them off the stage. Since I was exhausted, I splurged on some caffeine. I gave it up a few years ago, and even as I had my first sip, I leaned to my friend and whispered, "This will probably keep me up all night." I finally fell asleep around 2 am. I am a glutton for punishment. Lack of sleep and a terrible sore throat made me a little laid back today. My excitement last night about getting into real learning has waned. That's a bad sign, considered the excitement usually lasts at least the first week! In the throes of researching Neptune with Elijah and telling Josiah that school really did start and he really does have to sit down and work, all I could think about was a nap. A nap and maybe some orange juice. We don't have orange juice, or anything else palatable in the house right now. See yesterday's post about my Latin exploits and that may clue you into why I haven't had time to grocery shop. I found some frozen burritos in the garage freezer and slapped them down for lunch today. Elijah was so excited, "This is like, oh, memories! You used to buy these all of the time when we were little!" Score one for me by accident. I bought those nasty things for Everett since he's been avoiding food and I'm experimenting on what might tempt him. Easy + delicious + healthy = impossible I'm at the place where I don't care if it's healthy I just want him to eat. If I walked into the kitchen and he was pouring the chocolate syrup directly from the bottle into his throat, I might flinch but I also might applaud. My dreams of a yummy lunch and reading a great book aloud were thwarted by a poor decision 12 hours ago and a nasty virus. Starting school is always high on the 'need to make this super amazing' list so the threat of mom guilt lurks. Frozen burritos feel like a fail, but who knew the kids thought it was great. A memory for lunch. My mom guilt was gone and I even gave myself permission to get a guilt-free nap. I woke up to a little chaos, along the lines of Josiah chasing Ella with her prosthetic leg. Go figure. It seems fitting that my first day of blogging would begin on the first day of school. And that my husband would come screaming down the hallway in his underwear while pumping his fist in the air, "I got him! I got him!" A rather unusual wake up call. I was still groggy after a night of strange dreams, no doubt because of the frantic school preparations that went on last night. His excitement was a little irritating. Then it dawned on me. The mouse. Three months ago our freezer broke. We have a massive, rather expensive and rather new, fridge. We bought it in the dent and ding section of the appliance store and then bought the warranty. Seth's mantra has become, "They don't make them like they used to." Hence, my two sets of 30 year old washers and dryers in the basement. I have a back up in case one fails, because we definitely wouldn't want to buy a new one. No way. Even though I really miss my beautiful front loader. Really. This repair guy has been coming every three weeks all summer trying to fix our freezer. Our last visit revealed a little visitor behind our fridge. I was appalled and a little embarrassed. Seth was downright mad. The repairman, who has become a familiar face around here, suggested sending one of the cats behind the fridge. Those stinkers showed no interest in the mouse, they probably thought it was another one of the pets. They enjoy bringing already dead rodents into the house, but evidently they don't feel like taking care of one in the house. Irritating. Seth declared war on this mouse and the hulking fridge has been sitting in the middle of the kitchen waiting for the mouse to take the bait. Tricky little guy, he taunted Seth for a few days by eating the peanut butter from the trap. Thus, his excitement this morning, he finally outsmarted the rodent. I was exceptionally nervous this morning because I am teaching Everett's class at our Classical Conversations campus. I can't determine whether my nervousness is because Everett is in my class, or because I haven't ever covered the material we will be learning. It could be that I just fried my brain by cramming one year of Latin into the past two weeks. When I started my school preparations, I didn't realize how long it would take for me to do lessons 1-6. I also didn't know that first year Latin students spend their first year on ONLY lessons 1-6. When it dawned on me, in class this morning, that I just completed a year of Latin in two weeks, I sagged in relief. I'm not an idiot, that was truly an accomplishment! Alas, I'm starting off in an already burned out state. Armed with my purple gel pen and my new power shirt, gifted to me by my sister, I loaded up the van with learning materials and students. This is the first year we didn't pose next to the Black Eyed Susans wearing new school clothes for our first day of school pictures. Instead, we frantically threw lunch boxes, children, and backpacks into the car and sped off. The day was truly a blur of books and discussion for me. I think it went well. That is the best we can hope for, right? My grandma said this to me. Probably, she said it to a group of her grandchildren about snapping green beans or shucking corn. My grandpa always had an enormous garden and many hands did indeed make light work. Instead of my grandma working her fingers to the bone, we all pitch in and soon the bushels of just picked beans slowly become rows of canned beans. I have repeated that phrase many times over the years. The truth rings clear whenever faced with an insurmountable task. As FourHearts begins its ministry to pregnant and hurting teens, an insurmountable task faces them. In the throes of forming a Board of Directors, establishing itself as a non-profit, and navigating the laws of Puerto Rico, they are hoping to get their first safe house, Hogar En-Hacore running. The overwhelming mission ahead is made even more burdensome by trying to raise $35,000 to open Hogar En-Hacore. In Puerto Rico, Nidza has the framework established, the employees are ready, the facility waits, but the funds are lacking. I don’t have an extra $35,000 stowed away. God keeps my family hopping in our finances so we are always flushing our savings away on new pipes, new prosthetics, or the like. But, I do have enough to stop for a cup of coffee with a friend. Or buy that book I’ve been hearing about on Amazon. I have enough. I have more than enough. I want for nothing. I definitely have an extra $5. I venture you might have a spare $5 too. Danica thought, if we all donated just $5, what might happen. 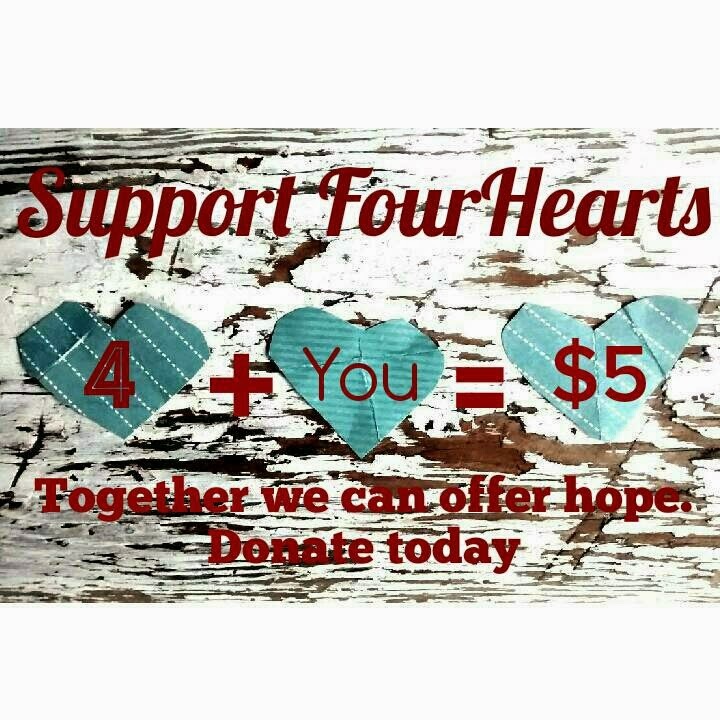 If you pulled that wadded up five from the bottom of your purse and donated it to FourHearts, and I grabbed that forgotten five from the top of my dryer—could we put enough fives together to make a dent in the funds needed to open the first safe house? My grandma says so. I agree. 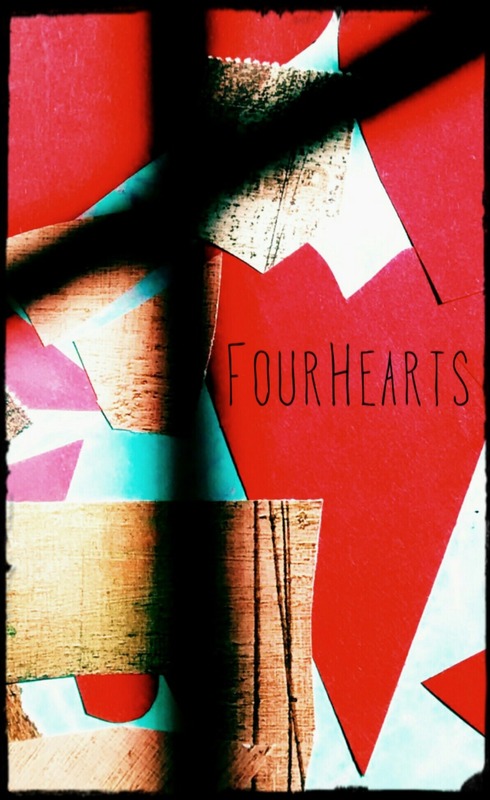 For the next four weeks, FourHearts will be holding it’s first fundraising campaign. Let’s see how much ‘work’ we can do. Every little bit helps bring the home to completion. It helps bring hope to one girl who is scared and hurt and needs a safe place to recover. Everett and Elijah have been swimming for several summers. They detest jumping into a cold pool at 6:30 every morning, but the friendships far outweigh their early mornings. The meets are long, but fun. After several sweaty years of watching from the stands, Ella and Sally begged to join the team this summer. Though the team takes even the youngest swimmers, beginning at five years old, they must be able to swim two strokes. Sally has only recently been able to swim a front crawl successfully. Her backstroke brings even the most lackadaisical lifeguard to his feet in worry over her drowning. She flops this way and that, all of her appendages moving independently of each other. I fear for her life. Nevertheless, we thought the coaches might be able to work with her. Ella is a different story. She is incredibly athletic. Lacking a foot and hand hasn't slowed her down. Nothing is impossible for her, swimming included. I emailed the coach before the season began expressing some of my worries. Ella is still wearing a size 8 bathing suit. Some of the 12 year olds on the team that she swims with are my size! I knew she would be creamed based on size alone, so I wanted to protect her. Add to the issue of her size the fact that she's missing body parts...it could easily become a summer of disappointments. Everyone wanted to swim in the first meet and every meet following. Sally griped because she always came in fifth. Ella popped out of the pool ecstatic because she always felt like she won. She was always very, very far behind the other swimmers. Maybe she thought she finished so far ahead that everyone else was still swimming. Either way, she loved the summer swim team. The meets were a challenge for me. Ella's mental abilities didn't allow her the acuity necessary to know when to go to the pool deck. If, by chance, she showed up for her event, she most often stood at an arbitrary lane. I watched like a hawk as her events drew near. Racing from the stands, many evenings I grabbed her from her perch on the low benches behind the blocks only seconds before the event began. Without her prosthetic, she crawled onto the block and kneeled, poised for the beep. Instead of diving, she would plummet into the water, only slowing her start as the tall, limber swimmers dove into the water. The race was on. Ella, being 12, is forced to swim 50 yards. She was strong during her first 25, but began to slow as she approached the far end of the pool. I could always make out the voices of her coaches cheering from the sides. Usually, a cluster of pre-teen girls would stand at the far end of her lane waving their arms and cheering. By the time she began her flip-turn, the other five swimmers would be hitting the finish, panting. Their swims completed, the event over, sans one lonely swimmer in lane 6. Ella is rather proud of her flip-turn. Finally, she learned how to do it, and never hesitates to show it off. It's sweet, but cumbersome and slow. Her energy wanes as she pushes off the wall with her good foot. By now, all eyes are on lane 6. The parents watching their daughters have turned their attention to the small girl struggling to finish her event. They probably noticed her at the start, she was the only one kneeling on the blocks, but their attention would have been focused solely on their athlete. Until now. All eyes are on Ella. I can't hear Ella's coaches any longer, my own voice drowns them out. Then I realize, it's not only me. People are on their feet, cheering for Ella. Elijah always says he can't hear anyone while he swims. I yell relentlessly because I am that wild, encouraging mom. I believe they can hear my voice. As I watch Ella finish the last 10 yards of her event, I can see by her face that she hears. She is smiling. A big, toothy, wide smile pops up every other stroke. I silently chant, "Just breathe, don't smile!" She finally tags the wall and the pool erupts. My arms are covered in chills and my eyes filled with tears. As summer passed, relatives in town visiting always took the opportunity to come for a swim meet. At the summer finals, my in laws crowded next to me as we watched Ella finish her event. The crowd screaming, my mother-in-law looked at me in tears and said, "Does this always happen?" Ella taught me something this summer, it's far more important to give her an opportunity than to protect her. What she may lack in physical strength, she makes up for in sheer will and determination. The courage of that humble little girl is awe inspiring.